A real treat for the autumn and the coming festive season. 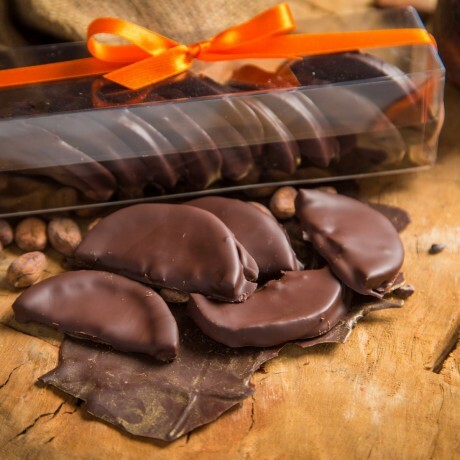 Flavoursome candied orange slices dipped into delicious, 75% single origin dark chocolate, that complement the juicy, bitter sweet flavour of the orange. Each slice is and carefully hand dipped in Bianca Marton Chocolates own workshop, and packed for a generous, sharing portion. Candied orange slices ( Slices of Orange, sucrose, fructose, dextrose, maltose, preservative: E-202, acidifier: E330). Dark chocolate, min cocoa content 75% (cocoa mass, cocoa butter, cane sugar). Made in an environment that also handles nuts and flour (gluten).